How do you know if you’re overbuilding? Here are ten signs for your mental checklist if you’re considering a significant addition to the size of your home. If your house is going to be twice as large as all others in the neighborhood. If you no longer need Neighborhood Watch because your house towers over all others and is a watchtower in and of itself. If you have double the bedrooms of other homes in the neighborhood. If your house is mistaken for a motel or residential care facility. If you can see in every backyard on the street. If what you are building will yield little value in the resale market. If the larger size removes the rear yard and thus creates a negative for buyers. If shade from your house lowers energy bills for neighbors on every side. If buyers don’t have the expectation for such a large house in the neighborhood. Obviously some of the points are only for fun, but you get the gist. If what you are doing is not consistent with the look and feel of the neighborhood as well as the expectations of the marketplace, then you’re probably overimproving your property. Watch a fun 30-second clip below of an overbuilt house I saw in Sacramento (and here is another in Woodland). 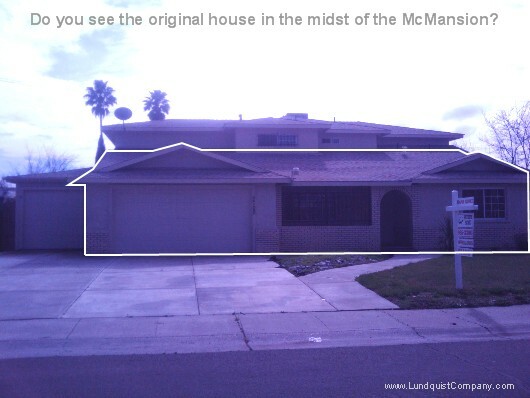 I took a photo of a “McMansion” today in South Sacramento. This house is currently for sale and is a whopping 3,293 square feet in the middle of a neighborhood of mostly single-story 1100-1400 square foot homes (with 3 or 4 bedrooms). It looks like this one may have actually been 1607 square feet originally, so it was already on the upper end of gross living area for the neighborhood, but now it has grown to over twice its original size. This house weighs in now as a 6 bedroom / 3 bathroom property (with a 3-car garage). What do you think?